Through the hustle and bustle of the holiday season, I was able to catch up with Randi Lattimore, Mind Body Director of Midtown Athletic Club in Rochester, New York. Randi has helped cultivate a community of mindfulness and discipline while encouraging members to have fun and center themselves. As enjoyable as the holidays are for many, they can also be stressful with multiple parties, to-do lists, gift shopping, increasingly high sugar intake, and more. Randi explained the importance of taking care of yourself during these times. Self-care doesn’t only mean facemasks and pedicures, but rather knowing how to de-stress when life gets busy, quieting your mind, and doing what feels good to you throughout the day. By taking care of yourself you’re less likely to get sick and more likely to be present with loved ones, be more productive, and more resilient to whatever life throws your way. Check out more of Randi’s helpful tips on how to be present and take care of yourself throughout the season. Midtown: Out of everything Midtown has to offer, why yoga? Randi: There are so many reasons I enjoy yoga and the reasons are always changing. Right now, the ability that I have to quiet my mind in yoga and let go of distractions has me craving my yoga practice more than ever. Yoga has this way of siphoning out what is important, and it gives me the time to acknowledge and be grateful for those things. I find that when I am in the present moment, I am more creative, more thoughtful. Yoga helps me manage my energy and mood. It brings me into balance. I love the self-reflection that yoga offers. Midtown: What are the biggest benefits of staying true to your practice during the holidays? Randi: In the hectic pace of the holiday season, taking the time for a yoga meditation practice helps us all find grounding and peace. People often stress over the holidays, while yoga can help melt that stress away. Take time to breathe. Our breath and emotions are heavily connected and we can use the breath to control our emotions and stress. 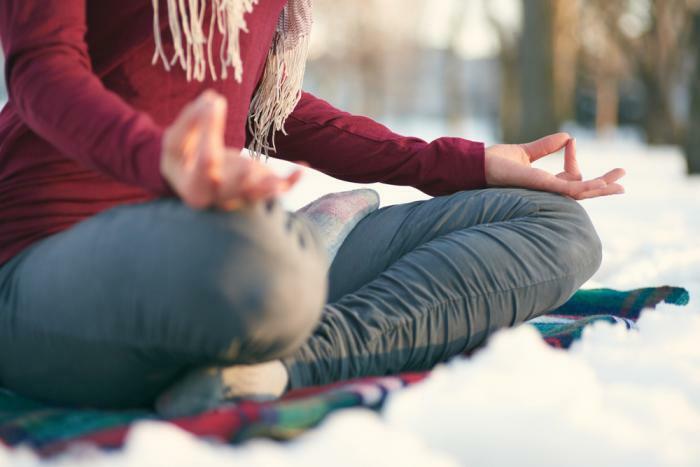 A yoga practice is a great space to explore and focus on the true gifts of the season. Midtown: What keeps you motivated during the holidays (or cold winter) months? Randi: Knowing that my friends and classmates are waiting for me at the mat is a big motivator in the cold months. Building strong relationships with members and fellow associates and knowing they will be waiting for me helps get me excited to practice. Midtown: What is a quick tip for anyone feeling stressed during the holidays? Randi: Create a morning ritual. Even if it’s just taking a few minutes to sit, meditate, journal, or enjoy a cup of tea. Taking the time out of your busy schedule for yourself will allow you to become more focused and relaxed throughout the day. Midtown: What class is your favorite? Why? Randi: Of course, yoga, but I also love the benefits of barre and Pilates too. When I am regular about my Pilates practice, my body just feels like it is working better. I teach mostly Power Vinyasa in a heated room, but I love all yoga and always feel like I learn something new about the practice and myself in all classes including Gentle and Alignment. Yoga Jam is a class that allows me to be creative and playful on the mat, and right now that feels amazing. Midtown: What can someone new to yoga expect when coming into the mind body studio for the first time? Randi: At Midtown we understand that trying anything new can be intimidating, but we’re here to help. Yoga teachers love new yogis and enjoy sharing the experience with them. Please arrive 10-15 minutes early, take time to set up your space, and get comfortable. Introduce yourself to the teacher prior to class to let him/her know that this is your first time taking this class, and share any injuries you may be working through. I like to encourage people to sit for a few minutes and stretch or meditate prior to the start of class. It’s also a nice time to smile at someone next to you and introduce yourself as yogis love to connect. Finally, remember that yoga is not a competition. “There is no finish line” is the best advice I’ve ever received. It’s called a practice because each day is different, and the journey is what is most important. Pop into a yoga class and take care of yourself this holiday season.